Checks for minimum VP rule, if it's suitable, starts voting round. Do that in a python3.6 virtual environment and it will install all the requirements. Configuration is stored in JSON files. You can find an example in the repository. Note: tagbot runs on voting rounds to preserve the VP. You need to set a crontab entry to run the bot periodically. Use github issues or find me at Discord. (emre#9263) for any feature requests or bugs, bug-fixes. Hey @howo, I just gave you a tip for your hard work on moderation. Upvote this comment to support the utopian moderators and increase your future rewards! I actually needed this, my VP is constantly wasted because I forget to use it, I'll just use it on my personal account! actually checking for view counts and comments may be additional filters. :) check this to install steem-python on Windows. Thank you, I was about to give up on my windows install, inspired by the fact that it will work, I will attempt once again using the miniconda python distribution. Then I would like to try getting an upvote bot as you explain in this post. One of the big challenges for a noob like me is finding posts and folks to follow, its part of the steemit journey! I can actually answer for him as I've looked at the code. As you can see, it supports any tag you want to vote on. There's no list, you input the exact tags you like. That's exactly what I have been trying to do (i want to make a free service for people to support the communities/tags they like) but couldn't make the votes go through while streaming posts worked fine for the tags targetted. I could also vote on a post via permalink. You also wet went as far as putting the blacklist and a list of rpc nodes. Awesome job. Thanks for python noobs like me. I will give it a try asap. Resteem for the occasion. glad to hear it's helpful for you. Hey @emrebeyler I am @utopian-io. I have just upvoted you! Thanks for the enlightment, i hope i can work it well sha. Hello, I was curious about setting up a bot for my discord server and others. 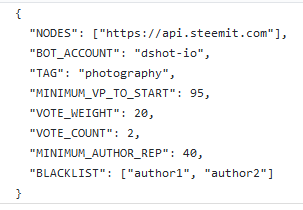 I want the ability to take a specific tag off of Steemit and post each url from that tag on Steemit and post in a room on my server(s). Can you point me in the right direction or do you know if someone that I can hire to make this happen? Thank you I appreciate your time.